ClubCoins Needed: 144 Please note that this item is not available on your device. You may add the item to your Wish list and redeem from a compatible device. There are laws of nature, so why shouldnt there be laws of marketing?As Al Ries and Jack Troutthe world-renowned marketing consultants and bestselling authors of Positioningnote, you can build an impressive airplane, but it will never leave the ground if you ignore the laws of physics, especially gravity. Why then, they ask, shouldnt there also be laws of marketing that must be followed to launch … and maintain winning brands? 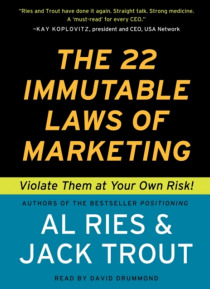 In The 22 Immutable Laws of Marketing, Ries and Trout offer a compendium of twenty-two innovative rules for understanding and succeeding in the international marketplace. From the Law of Leadership, to The Law of the Category, to The Law of the Mind, these valuable insights stand the test of time and present a clear path to successful products. Violate them at your own risk.